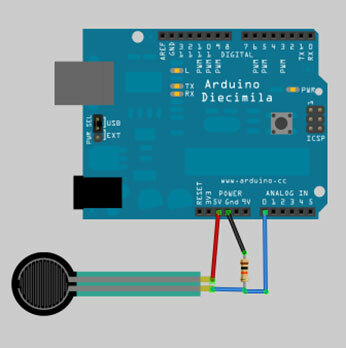 The resistor is used with sensors that only have two outputs, including switches, bend sensors, and pressure sensors. 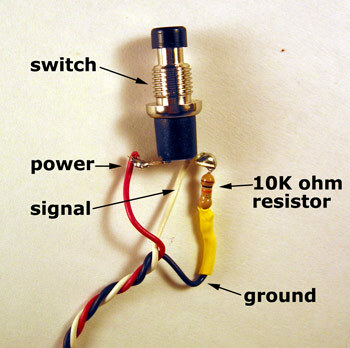 The value of the resistor depends on the kind of sensor, but it often has a 10K ohm value. In the case of sensors like pressure sensors, they have their own basic resistance values, which means a resistor value of less than 10K ohm is needed. For example, for the pressure sensors we sometimes use, a good value for the resistor is 4.8K ohm. If you are working with a switch, you should normally use a single pole, single throw (SPST) switch. You can use either a momentary switch or a toggle switch. The momentary switch only makes contact while you depress it. The toggle switch holds it position in either on or off position.